Supply, installation and repair specialist, CP Automation, has joined forces with VASCAT, manufacturer of electric motors, and Magnetek, market leader of crane and hoist systems. Together, they are providing a complete package of motors, crane collision avoidance systems, radio control systems and power delivery systems for crane original equipment manufacturers (OEMs), to improve safety and performance. 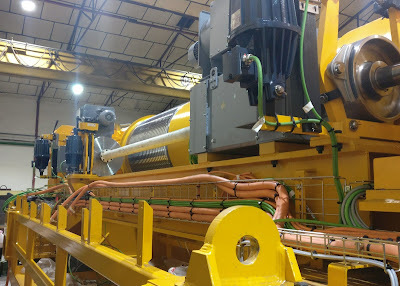 CP Automation is strengthening its already existing product family, having supplied EMC filters, line and motor chokes and braking resistors to the crane industry for many years. As the company continues to serve the market, its work with VASCAT and Magnetek provide further opportunity to take advantage of market growth. "Our partnership with CP Automation has evolved over the years," said Jan Santaló, drives segment sales manager at VASCAT. "Alongside Magnetek, we are making it much easier for crane OEMs to source the components they require. "VASCAT motors can be either used as part of modernisation projects or integrated into new crane designs. What sets us apart is that we customise our motors to suit the specific crane application, and we conduct the necessary validation tests to ensure safety and longevity." CP Automation also supplies radio remote control systems in partnership with Magnetek. This complements the movement away from cab controlled cranes, where-by the operator sits in the crane guided by hand signals from a floor walker, to radio control systems that use a cordless unit to direct the crane. This means the operator is out of range of load swings and potential drop loads. "The partnership brings together the right set of products to support the current rapid growth of the crane industry," explained Andy Swann, business development manager EMEA at Magnetek. "We are seeing more and more crane OEMs moving away from in-cab operators and opting for radio remote control. This safe distance means much more aggressive materials can be handled during a project, as well as providing the freedom of movement to gain better visibility." Magnetek also manufactures collision avoidance systems, power delivery systems and failsafe brakes for added safety functionality. It you are a crane OEM, rebuilder, repairer or end user looking to source a collision avoidance system, radio remote control system or motor, you can call +44 (0) 1724 851515 to speak to a member of the technical team at CP Automation about both VASCAT and Magnetek components.